In 2007, a Vancouver artist named Jeff Ellis decided to bring together several local indie comic book creators for a collective project. A year later, Robots, Pine Trees, & Broken Hearts was published, nine stories written by nine independent BC comic artists. This was soon followed a year later by Historyonics, an anthology of historical fiction. 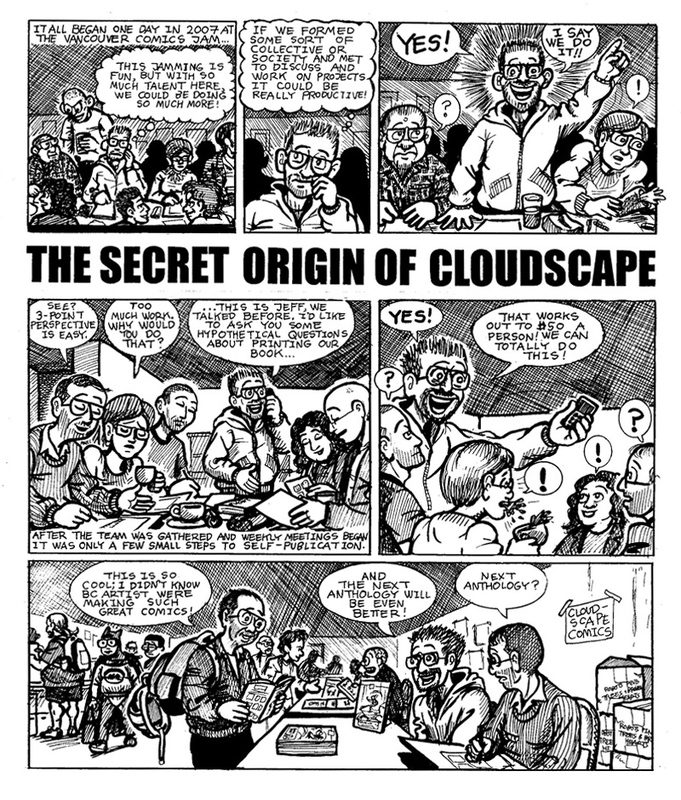 Since then, at least one comic anthology is produced by Cloudscape each year. Each anthology is centered around a unique theme so that they stand alone and encourage all artists to push their ideas in new directions. The Cloudscape library includes Funday Sunnies, a tribute to the classic Sunday colour comic strips; Exploded View, a robot-themed science fiction anthology; 21 Journeys, a full-colour collection centered around travel and self-discovery; Giants of Main Street, tales of fantasy and magic set within urban environment; Waterlogged, a hardcover two-colour collection of ocean-themed stories in numerous genres. In 2014, Cloudscape began receiving publishing grants, and put out Mega Fauna, an all-ages full-colour anthology of stories involving animals, and Epic Canadiana, a tribute to 40’s-themed Canadian superheroes. In 2015, with help from the BC Art Council, Cloudscape began publishing more titles per year, including Epic Canadiana II, an anthology homage to 1940’s Canadian superhero comics, and two solo artist works: Una the Blade by Steve LeCouilliard (a swords & sorcery adventure starring a barbarian single mom) and the YA tale of high school monsters Last Night at Wyrmwood High by Kathleen Gros (a YA tale of high school monsters). In 2016 we published Bones of the Coast, a horror anthology of frightening stories all set in BC. In 2017, we published two more solo artist works, Fir Valley by Jason Turner (a dark mystery set in an isolated BC town) and Feast of Fields by Sean Karemaker (a surreal memoir). Our latest book, Swan Song, came out at the beginning of 2018, and is filled with stories from numerous genres, everything from science fiction to drama to autobiography, all based around the theme of music. As a non-profit society dedicated to the growth of BC’s comic industry, however, the Cloudscape Comics Society goes beyond publishing. In 2012, the Vancouver Parks Board awarded Cloudscape Comics the Memorial South Park field house to use as its collective studio space through the Artist Studio Residency Program. Through this increased involvement with the city, Cloudscape has spearheaded art and comic classes, discussions on the art form, comic jams, public art pieces, and numerous other activities that engage the people of Metro Vancouver with the fascinating world of comics. Some of the events that Cloudscape has been involved with include the Vancouver Art Gallery’s Family Fuse, Stanley Park 125, Culture Days, Langara College’s Graphic Novel & Comix Program, art classes at Sunset Community Centre, Creative Ink, and, of course, the Vancouver Comics Art Festival (VanCAF). You can learn about all upcoming classes and events on our Events Calendar. As a fast-growing organization, Cloudscape is constantly exploring new projects and seeking new ways to expand the scope of its open membership. Through this dedication, The Cloudscape Comics Society will continue to be an integral part of the BC comic arts scene for years to come.